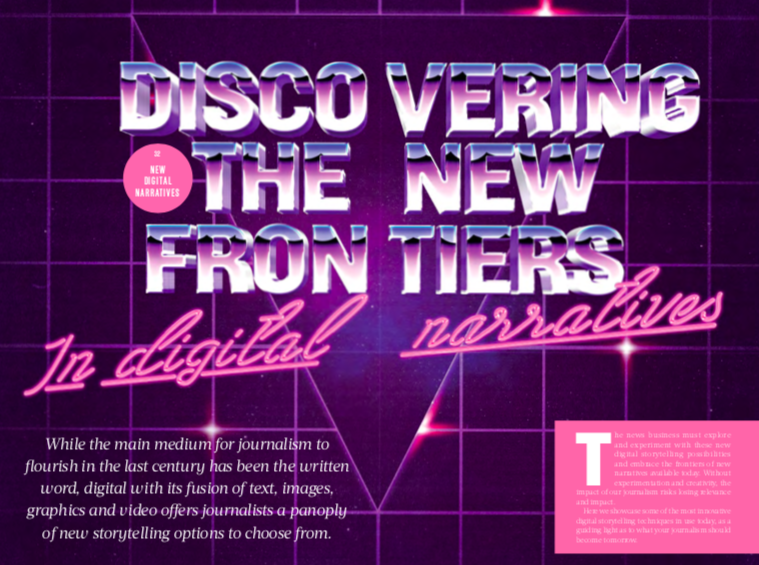 While the main medium for journalism to flourish in the last century has been the written word, digital with its fusion of text, images, graphics and video offers journalists a panoply of new storytelling options to choose from. The news business must explore and experiment with these new digital storytelling possibilities and embrace the frontiers of new narratives available today. Without experimentation and creativity, the impact of our journalism risks losing relevance and impact. Here we showcase some of the most innovative digital storytelling techniques in use today, as a guiding light as to what your journalism should become tomorrow. 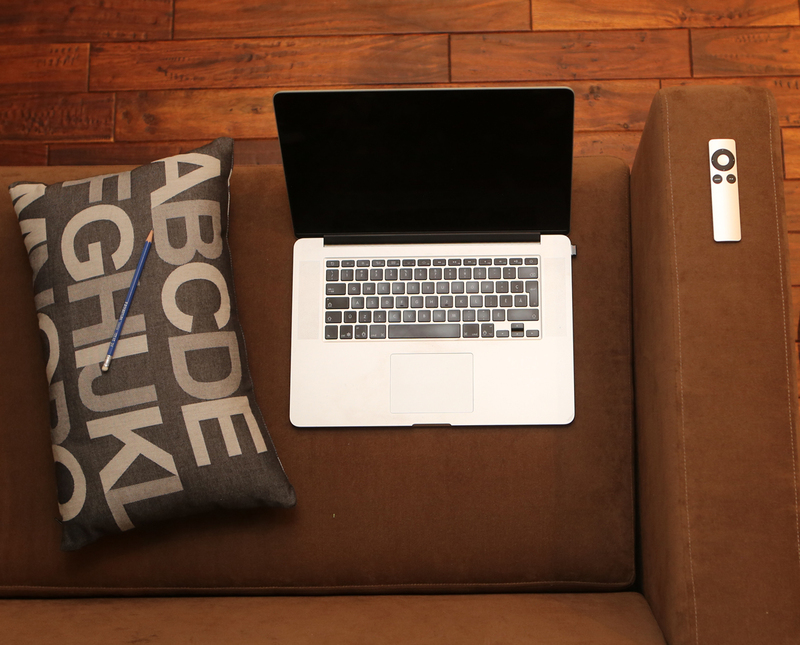 This documentary on internet privacy takes personalization to a whole new level. 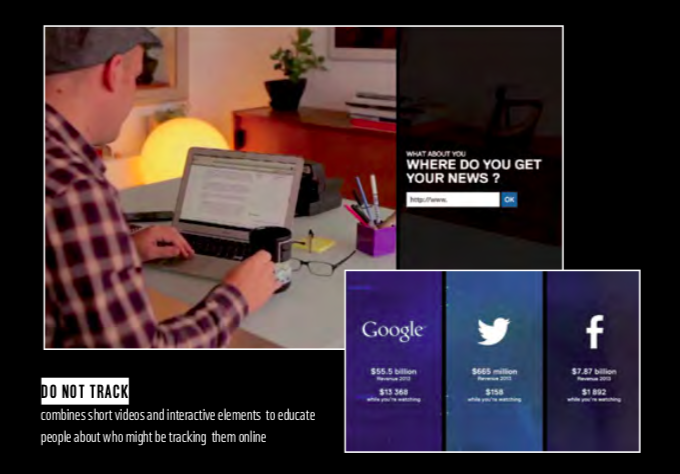 The interactive combines short videos and interactive elements to educate people about who might be tracking them online and the amount of private information that might be extrapolated from their Inter- net activities. A few minutes after it begins, the documentary adapts itself to the place, time and operating system of the viewer, demonstrating a scary case of how everybody shares information in a non-voluntary way. With data collected in real time from your IP address, this interactive has as many versions as views. As the chapter evolves, you are invited to share some of your internet habits, so you can see in real-time how your own personal data is being tracked. In this way, the seven-episode documentary helps users to track the trackers, understanding their tools and methods. 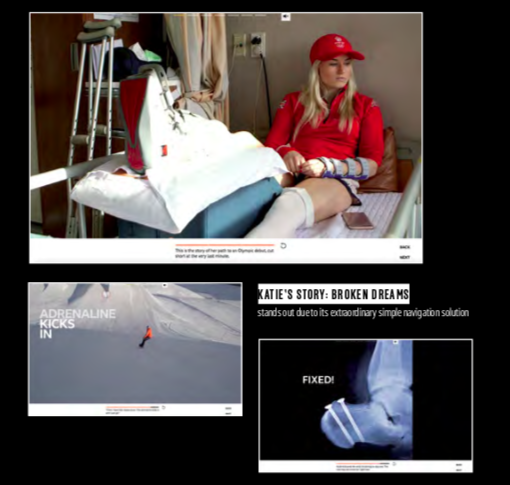 This pure mobile narrative (there is almost no point in watching it on a desktop) tells the story of Katie Ormerod, a British snowboarder described as “arguably Britain’s best medal chance for Pyeongchang 2018”, who was forced to withdraw from the Games after breaking her heel in two places during training. This seven-chapter vertical video uses pictures, videos, graphics, narrators and Ormerod’s own voice to describe her journey in training, jumps and pursuing her Olympic dreams. With a precise script and beautiful shots of snowboards jumps, the piece stands out due to its extraordinary simple navigation solution: at any time, the viewer can understand in which part of the documentary they are. 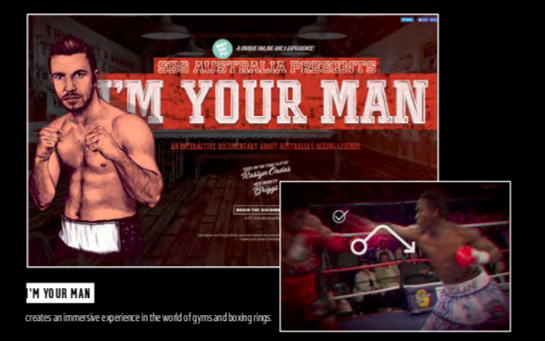 This interactive documentary tells the story of four famous legends of Australian boxing through an immersive experience in the world of gyms and rings. Making use of interactive videos and an interface based on mouse gestures, it allows the audience to enter different training sessions that, on completion, open the series to new chapters. A subtle use of gaming slightly affects the plot, whose highlight is some historical fights in Australian boxing. The excellent soundtrack, which includes the testimonies of the boxers, provokes a deep level of engagement with the story and its characters. The special documentary – the adaptation of a play – won numerous awards, and was produced by the Australian channel Special Broadcasting Service. This is one of the ambitious special interactives produced by the strong and diverse team at the Washington Post. The 3-part multimedia project takes readers to eight countries across three continents and examines the divisions between countries and peoples through interwoven words, video and sound. The producers wanted to make the experience as seamless and simple as reading text, so they decided to focus on three episodes: an overview that explained the phenomenon and why it’s happening; a case study of Europe, evaluating how well walls have worked to stop the mass flow of migration; and on the U.S.-Mexico border, where building a wall presents myriad logistical challenges. The pictures, the narrative, the text, the videos and the simple and useful vertical index help to create a beautiful experience. 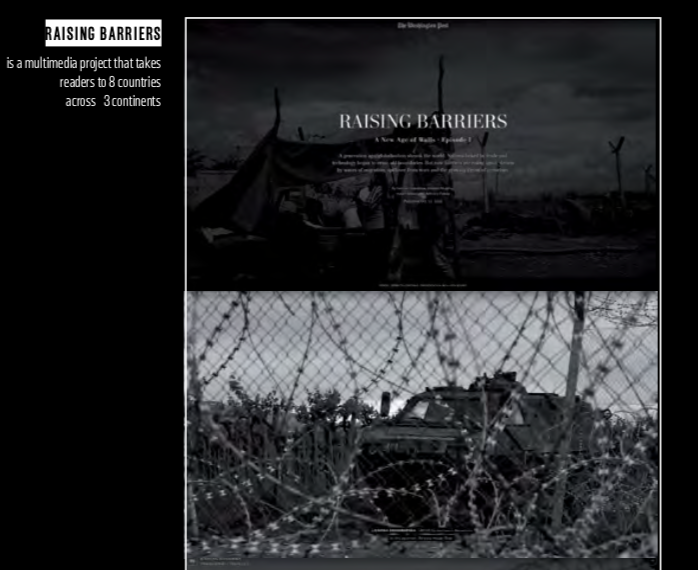 Raising Barriers –with more than 70 people interviewed–probably goes as far as a big newsroom can go in telling a huge story, while at the same time establishing some principles that can be followed by the rest of the industry. This video documentary with a sharp cinematic approach dives deep into the tensions between governments, intelligence agencies and individuals as data collection grows and personal privacy is eroded. The Five Eyes Alliance is a government spying network that consists of the US, UK, Canada, Australia and New Zealand, and allows them to share their intelligence. Through interviews with major players filmed across the ‘Five Eyes’ states, the documentary examines the rationale for universal surveillance and cybersecurity, against the implications for freedom and democracy. The documentary is a five-chapter story, with each one including a 7-minute film and an “Explore Further” marginalia. 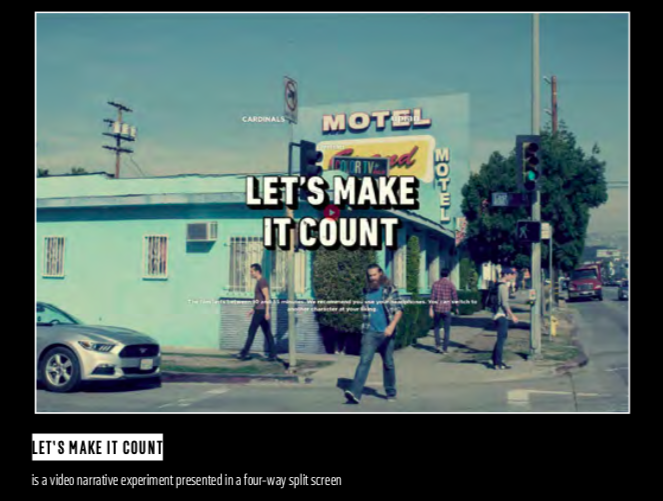 Each video has a scrolling time- line with more micro-videos, and repeated invitations to the viewers to share their thoughts on different subtopics. The film-like shooting, the perfect voice narration and a simple and beautiful user interface help the immersive experience which includes interviews with important characters including the ex-director of the NSA and CIA General Michael Hayden, investigative journalist Nicky Hager, cybersecurity expert Brian Contos, NSA whistleblower William Binney and former Anonymous hacker Gregg Housh. This is one of the most powerful demonstrations of how a simple but bold idea can create a project with meaning and impact. In the 1990s, during his 10-year reign as president of Peru, Alberto Fujimori launched a family planning programme that resulted in the sterilization of 272,028 women and 22,004 men in just four years. They were almost exclusively indigenous people living in rural areas, and thousands have claimed this was done without their informed consent. Their stories have taken a long time to emerge because the subjects have almost no means of media representation: many of them are illiterate or only speak Quechua. To shine a light on those stories, the authors of Project Quipu created a simple 1-800 telephone number connected to a website where victims of this abuse can record their testimony. 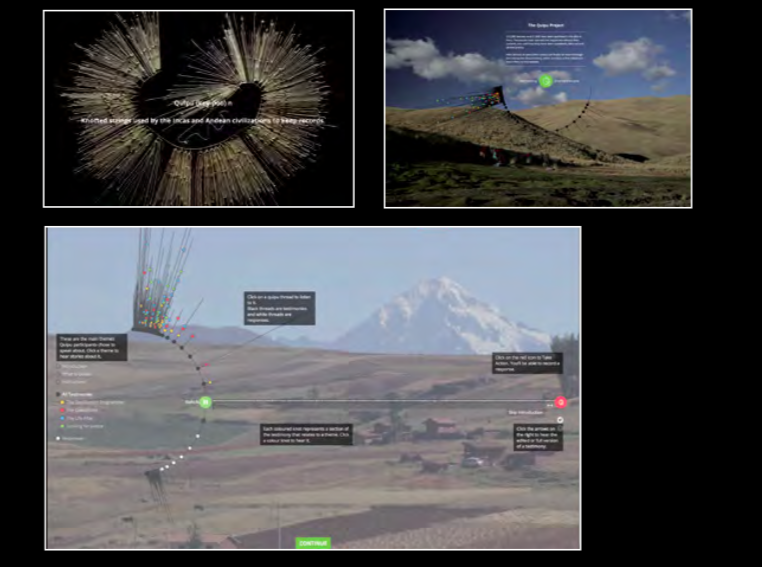 The result is a strong interactive audio documentary that can be navigated through a visual “quipu”. Quipus are knotted cords that were used by the Incas and ancient Andean civilizations, to convey complex messages. The Project reveals the power of voice in telling moving stories in the first person. Les Cardinaux is a collective of four French film- makers who created Let’s Make it Count, a video narrative experiment from which journalism can learn. It’s a fictional story of four friends who spend their last vacation day in Los Angeles, and each one decides to follow a different path. Presented in a four-way split screen, the simultaneous stories began leaving the viewer the option to follow all the stories, to choose a full screen for any of them, to select the audio of a specific story, or to hear to all of the audio tracks at the same time. Even though the experience can be a little discombobulating, it opens the door to following experimentations with video streaming of live news events. The New York Times used the scale of the Winter Olympic Games at Pyeongchang to experiment with live direct messaging in a behind-the-scenes type of coverage. The deputy sports editor, Sam Manchester, sent short messages through a conversational interface that creates a more intimate, personal experience with the readers who sign up. At the same time, the use of AI software helps the Times to tailor some of the push notifications within the same timeline. As a follow up to the Rio Olympics SMS experience, in this case the whole experience happens inside the NYTimes App, opening up possibilities in terms of the kind of content, including reader polls and targeted messages according to readers’ choices. “What we’ve created is a bot-like exchange, but in the voice and tone of a person” the NYTimes explained, taking another step towards what many consider the stage of the future: conversational platforms. As a sort of sidebar to the story “Uber: The uncomfortable view from the driving seat,” FT created “The Uber Game”, in which you try to make ends meet by driving for Uber. The game claims to be “based on real reporting, including interviews with dozens of Uber drivers,” and is intended to show what life is like for Uber drivers who are under pressure to work as much as possible. This text-based adventure gives some goals that you have to achieve by making the right choices so as to maximize your earnings, from choosing to buy a car charger and a data plan, to working longer hours to hit bonus quests for extra cash. The game feels like a choose-your-own-story adventure, and even though it lacks strong graphics, it helps to understand the subject from the character’s point of view.